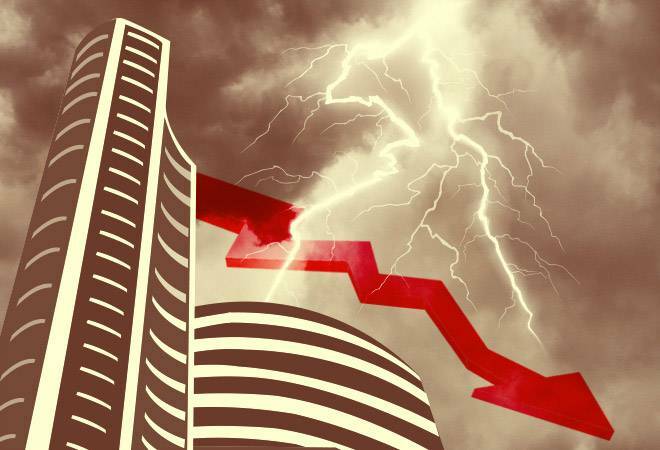 The Sensex and Nifty closed nearly 1.5% lower in trade today as amid a depreciating rupee, rising crude oil prices and selling pressure on stocks of non-banking financial companies (NBFCs). On the global front, China reportedly rebuffed a plan for talks with the US on resolving their dispute over trade and technology which roiled Asian stocks. While the Sensex closed 536 points or 1.46% lower to 36,305, the Nifty lost 175 points or 1.58% to trade at 10,967 level. This is the weakest closing since July 11 when it settled at 36,265.93. The index has lost 1,249.04 points in the previous four sessions. Sentiments remained distinctly weak in sync with declining global markets as the intensifying dispute between the world’s two biggest economies has spooked financial markets worried about the fallout on global growth, brokers said. YES Bank fell by another 0.35 per cent, taking its total losses to more than 29 per cent after the RBI curtailed the term of its founding CEO Rana Kapoor. Mustafa Nadeem, CEO at Epic Research said, “At present, market is still in a panic mode, to simply put it, VIX is up 15% at 17.8 levels. The Algo models were quickly able to identify and created sell side positions in the NBFC sector and we saw what happened to many stocks in that space. Financial services and banks were also caught in this brutal sell-off. Those levels of fear were seen back in January last week or February 1st week when volatility spiked and the global markets saw a major sell-off. So here at present levels something we can relate to is happening and going forward this may call in for a sector rotation, deleveraging in a stretched valuations market and liquidating as well. So we may continue to see declines interrupted with some minor pullbacks. A consolidation should be seen between 10800 – 11200 while all the above-mentioned things happen. On Friday, the Sensex closed at 36,841.60, down 279.62 points. It saw an intra-day swing of 1,495.60 points. The broader NSE Nifty shed 91.25 points to finish at 11,143.10. IT stocks were the top gainers on the Sensex as rupee touched 72.73 level against the dollar. The currency fell 29 paise to the dollar to 72.49 level against the dollar in early trade. The currency ended 43 paise lower at 72.63 level to the dollar in trade today. The domestic unit had closed 17 paise higher at 72.20 against the dollar on Friday on sustained selling of the American currency even as local equities witnessed a high volatility. TCS (4.51%), Coal India (2.10%) and Infosys (1.56%) were the top Sensex gainers. In fact, the TCS stock hit its all-time high of 2,214 in trade today reaping benefits of a decline in home currency. Top losers on the index were M&M (6.46%), HDFC (6.22%) and IndusInd Bank (4.94%). Meanwhile, brent crude oil price hit $80 per barrel mark in trade today. Aviation stocks were down 4-6 percent on the back of rise in oil prices. Oil prices rose about 2 percent on Monday as markets tightened ahead of Washington’s new sanctions against Iran, with some traders forecasting a spike in crude to $100 per barrel. Oil prices could rise to $100 a barrel by 2019, warned merchants. Oil prices could rise towards $100 per barrel by 2019 as US sanctions against Iran tighten markets, commodity merchants Trafigura and Mercuria said. Stocks of non banking finance companies closed lower in trade today. The Dewan Housing Finance stock closed 11.79% or 41.45 points higher at 393 level today. On Friday, the stock crashed 42.43 per cent to end at Rs 351.55 on the BSE. Intra-day, it tanked 59.67 per cent to Rs 246.25-its 52-week low. Bajaj Finance fell 5.25%, Gruh Finance 5.88%, Cholamandalam Investment and Finance 7.15%, Edelweiss Financial Services 8.43%, Indiabulls Housing Finance 7.57%, Repco Home Finance 5.30%, GIC Housing Finance 5.36% and PNB Housing Finance closed 7.56% lower on concerns among investors over shortage of liquidity in these firms. “There are liquidity concerns … financial stocks led the rally and now they are dragging the markets and it has a domino effect on sectors such as real estate and autos,” said AK Prabhakar, head of research at IDBI Capital. “There is a lack of trust in the markets. Take the IL&FS case – when a AAA rated company is suddenly downgraded, how can people trust rating agencies,” said Prabhakar. Meanwhile, auto and banking indices led the fall with the BSE auto index closing 872 points lower at 22,402 points. The BSE bankex too fell 679 points to 28,022 level. The bank Nifty too slipped 2.45% or 626.55 points to 24,970 level. Auto stocks were hit by petrol and diesel prices hitting all time high today. In Mumbai, petrol prices crossed the Rs 90-mark for the first time ever as a dip in the value of rupee and rise in international oil prices pushed rates across the country to new all-time high. The fuel now costs Rs 90.08 at Indian Oil Corp (IOC) outlets in the city while it is priced at Rs 90.17 at Hindustan Petroleum Corp Ltd (HPCL) outlets and Rs 90.14 at Bharat Petroleum Corp Ltd (BPCL) stations. Petrol prices were hiked by 11 paise per litre and diesel by 5 paise, according to price notification of state-owned oil firms. The hike pushed petrol price in Delhi to Rs 82.72 per litre and diesel to Rs 74.02.While the BSE midcap index closed 2.40% lower at 15,221, small cap index fell 2.72% at 15,333 in trade today. Market breadth was negative with 538 stocks closing higher compared with 2111 stocks falling on the BSE. China and the United States imposed new tariff hikes on each other’s goods on Monday and Beijing accused Washington of bullying, giving no sign of compromise in an intensifying battle over technology that is weighing on global economic growth. There was no sign that proposed trade talks between Washington and Beijing would go ahead. US regulators went ahead with a planned 10 percent tax on a $200 billion list of 5,745 Chinese imports including bicycles and furniture. China’s customs agency said it responded at noon by beginning to collect taxes of 5 or 10 percent on a $60 billion list of 5,207 American goods, from honey to industrial chemicals. Hong Kong’s Hang Seng index fell 1.6 percent to 27,499.39 and Australia’s S&P ASX 200 edged 0.1 percent lower to 6,186.90. Markets in Japan, South Korea, Shanghai and elsewhere in the region were closed for national holidays. Germany’s DAX fell 0.4 percent to 12,382.50 and the CAC 40 in France lost 0.3 percent to 5,479.86. The FTSE 100 in Britain lost 0.2 percent to 7,472.33. The futures contracts for the Dow Jones industrial average and the S&P 500 both fell 0.2 percent, auguring a slow start on Wall Street.